Our Young Carers love trampolining so we try to visit Jump at least once a year. After expending all that energy they're always hungry so we always have pizza afterwards. A lovely few hours in the evening and another chance to catch up with friends. We had a great weekend camping out with other young carers from Kent and Medway. We had lots of games including a mini olympics and ended each evening with a disco. The days were packed with fun, we even had a craft session and meet the creepy crawlies. Everyone was exhausted by the end of the weekend, the young carers loved it so much that they said they can't wait to do it again! Looks like we might have to plan another camp out in 2019. What an amazing weekend we had at Center Parcs. Once again we had fantastic weather for our holiday. Lots of cycling, swimming and slides in the Tropical Pool, Pizza, rowing, roller blading, badminton, BBQ and so much more. We even had a mini X Factor auditions game and lots of other group games. Look out for the photos coming soon. 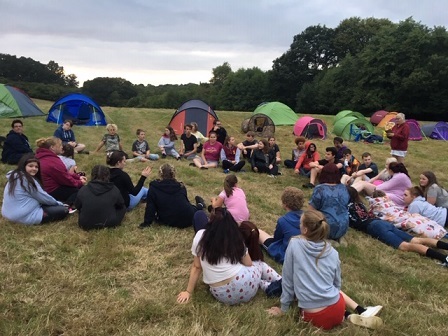 Our Young Carers love getting together and on a lovely warm evening what could be better than to spend some time outside in the evening sunshine. With a prize for the lowest score and any holes in one, there was great lght hearted competition between everyone. By the end of the golf everyone was hungry so we headed over McDonalds for some much needed food and more chat. Another great evening. We were so delighted that the Landmark Trust chose us again for one of their amazing 50 for Free weekend breaks where they donate breaks in their properties to charities for free. We took a small group of Young Carers for this amazing break in the lovely old property of Sackville House. Hide and seek was very popular as the house had lots of nooks and crannies that the Young Carers could hide in. There were plenty of games and we managed to get out and about too. It was a great opportunity for Young Carers to spend a couple of days relaxing and chatting with each other. 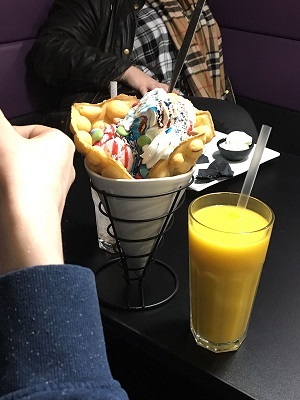 Even in the mddle of winter almost everyone loves ice cream and for those that don't there's always hot chocolate and waffles. It was a great chance for Young Carers to meet up, have a chat and eat some delicious goodies while they were there. A trip here is always very popular and not just with the Young Carers!